VANCOUVER ISLAND, B.C. 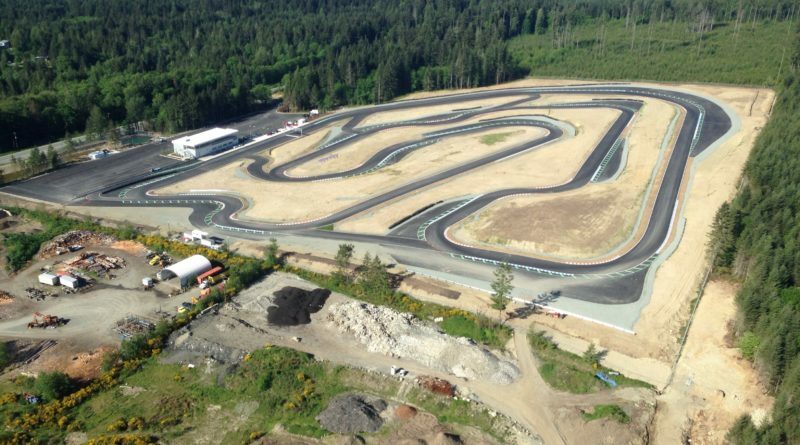 – The Vancouver Island Motorsports Circuit is best viewed from above for the first time. Approaching by helicopter and whirring above the tall evergreens, the 50-acre site looks almost Martian, its black ribbons of perfect asphalt and rounded dirt infields standing pronounced against the surrounding green forests that stretch forever in all directions. 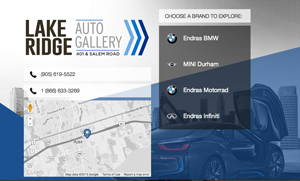 The circuit and facility, which enjoyed a soft launch in April ahead of a full membership push starting in June, just might prove to be the most brilliant and effective sales tool for any dealership in Canada. 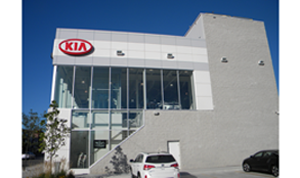 It is owned and operated by Vancouver Island’s GAIN Automotive Group. The owners of the nine- (soon to be 10) store group had a vision roughly 36 months ago to bring a slice of motorsports to the picturesque island off the coast of B.C. 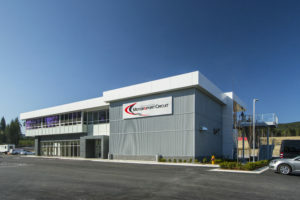 Now, with the dream becoming reality, the circuit has laid claim to being the first motorsport-themed country club in Canada and the nation’s only year-round driving facility. 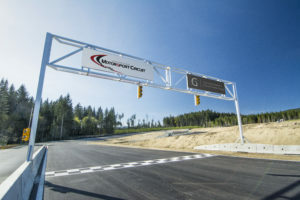 The ownership team invited select media to the track in early May to experience everything the facility had to offer and explain the relatively short journey from concept to chicane. The idea for the circuit was born on a racetrack in Las Vegas. GAIN partners Peter Trzewik and Sylvester Chuang were in Sin City at a Volkswagen dealer meeting that included some track time at the Las Vegas Motor Speedway. “We thought ‘Wouldn’t it be great if we could offer this much fun for our clients?’ ” Trzewik told reporters in early May. Born and raised in Germany, Trzewik’s pre-dealership history included a stint with AMG in Afalterbach (when AMG was still a privately owned company) and with the DTM Race team where he first worked with Kurt Thiim and Ellen Lohr and later with Klaus Ludwig and Bernd Schneider. He says that within a few weeks of that conversation with Chuang in Vegas, the community in nearby Cowichan Valley contacted the dealership group about the local cart racing club’s intentions of building a small go-cart track on the land. The original plan couldn’t secure financing and didn’t get off the ground, but knowing the community was warm to the idea of a track and with the area already appropriately zoned, GAIN executives bought the first 50 acres and went about making their dream a reality. Trzewik says they plotted a rough design, but after sending the layout to a few friends from the German racing scene and OEM partners including Mercedes-Benz, BMW and Porsche, it was apparent they needed real expertise. “No one wanted anything to do with it,” he says with a laugh. They contacted numerous companies but ended up with Tilke GmbH out of Germany. Though he assumed the massive company, whose credits tally over 60 racing circuits worldwide including Formula One tracks like the Circuit of the Americas in Austin, Texas and the Sepang International Circuit in Malaysia, was way too big to deal with this small project, it signed on. Tilke and GAIN agreed on a price and after approving the design in January 2015, the team, under the guidance of Tilke director of the Americas Christian Epp, were moving dirt by last March. Just 13 months later, cars at its first corporate event were whipping around the track. The 2.3-kilometre road circuit boasts 19 turns and five different layout combinations. At the base of the property sits a modern 15,000-square foot clubhouse that includes a museum-like showcase room, locker rooms, a professional kitchen, a massive second-floor lounge area leading to a wrap around patio and a huge classroom space that can be divided into three smaller rooms for events and training. The circuit also has a state-of-the-art safety camera and track light system for every sector. Timing and coaching technology from companies such as MYLaps and Racelogic are available as well to help drivers improve their skills. Whether a novice or experienced driver, members will receive coaching and instruction from a dedicated team of in-house instructors who will provide full access to the MyLap timing system. The Racelogic computer system also allows drivers to install the program in their car, giving them and their coach access to g-force, steering angle, brake points, throttle position, RPM, speed, racing line, and other key indicators for every point on the track and with the opportunity to compare up to six different cars and drivers to each other. An adjacent smaller circuit, skid pad facility, off-road course and related support facilities will be completed in the near future, as will secure on-site storage facilities for members’ track vehicles. Those are planned for the northeast part of the property and will accommodate approximately 100 cars thanks to a lift system. If all of that sounds pricey, you are right. Trzewik says the original budget of $5 million has been pushed beyond $20 million and counting. The team stresses, though, this is not about a quick profit. While they have existed in Europe for some time, motorsport country clubs are a more recent phenomenon in North America. The Vancouver Island Motorsport Circuit joins a growing number of clubs in places like New York State, Virginia, California and Nevada. Membership will be capped at 499 and include 30 founding members and 50 corporate members (the balance will be sold to individuals). Founding members pay an initiation fee of $200,000 and annual dues of $4,800 for a 50-year contract term. Corporate members pay a $100,000 initiation fee and $10,000 annually for a 10-year contract term. Individual memberships will cost $48,000 up front and $4,800 a year. The latter type is a 25-year term but can be sold back to the club after five years. Qualifying members can also add family members under the family membership package for an additional fee. The GAIN team expects to be sold out in two calendar years. It will likely be a popular spot for automakers looking to showcase future product or hold training sessions similar to Audi. Individual members will get 20 days per month with 10 days earmarked for corporate events. With fewer than 50 members signed up as of early May and ahead of the grand opening and June membership push, Trzewik notes they will likely host a number of corporate events to start. 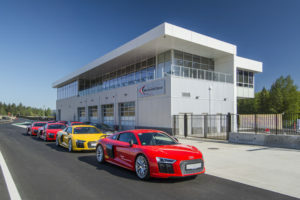 The first one came from OEM partner Audi Canada, which rented the facility for 23 days in April and hosted sports certification for service and salespeople, training for fixed ops personnel, a dealer meeting and five waves of customers who drove the new R8. Helping the facility to appeal to a broader audience is a multi-pronged plan that stretches beyond the racetrack. GAIN has built a beautiful hotel complex called the Villa Eyrie Resort tucked high above the Finlayson Arm inlet on the south facing side of the Malahat Mountain. Roughly 20 minutes from the circuit, the resort features a number of buildings with stunning vistas, spa service, a restaurant and more. Trzewik says the spot is perfect for families even if not everyone is looking for a boost of adrenaline on the racetrack. “A single phone call in the hotel will allow members the chance to plan driving time, fishing, golf and more. The idea will be to attract not just motorsports enthusiasts but position it as a destination for the entire family,” he says, adding the resort is close to great hiking, biking and the shopping offered in downtown Victoria. Before the grass has even sprouted on the infield, the team reveals there is a second phase to the project. In addition to the current 50-acre track site, GAIN has purchased an additional 225 acres surrounding the property that will likely see the construction of a high-speed power track in the years to come. GAIN executives say the second track will have long straights but will only be for members who have driven for a few years and have demonstrated they have the skill and control to handle higher speeds on a larger track. There is no timeline in place for the second phase but it will likely be a few years before any plans are put forward. Trzewik says the second track will likely run for 4.6 to 5 km with the original 2.3-kilometre road circuit operating as a technical infield. For more information about memberships, visit islandmotorsportcircuit.com.